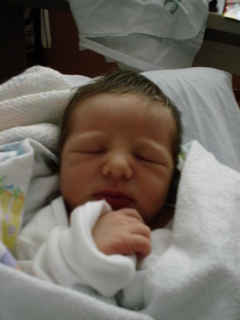 I have this beautiful, smart child. 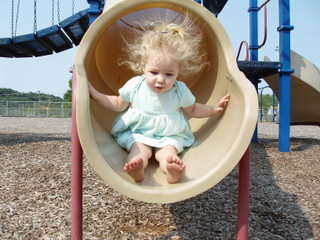 She is only 2. She is the only one we have, and will likely have. She wears me out and wallers me to the point that I am cranky, short-tempered, and sometimes mean. I don’t like myself when I feel and act this way. I love her and want to set a good example for her. 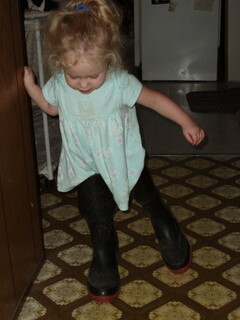 She mimics everything I do. What is wrong with me? 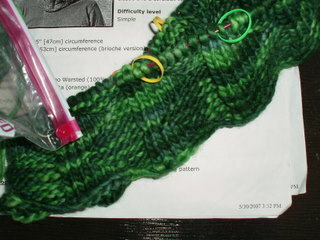 Other than needles, which I would consider a necessity, stitch markers would be essential. I hadn’t ever used them until I started knitting socks. Now I use them on everything! 2. If you’re heading on vacation, do you take knitting with you? If so, how much and what type of project? Yes, usually whatever I’m working on. 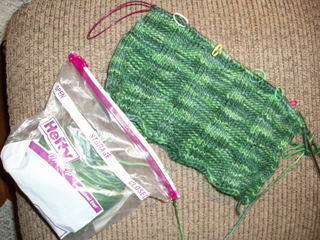 I don’t really do “big” projects like afghans or sweaters, so anything will work. Usually I take a few projects. 3. Where have you travelled to that you’d consider your favorite spot? I like Victorian Lace today. I bought it for the lace, which I am just starting. However, I find the reference materials in the back are EXCELLENT. 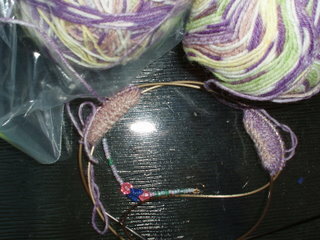 I really like Sticks and string, Knit Picks podcast, Stash and Burn, and She-knits podcasts. A blue-green, tealy color, probably. It depends on how big the mistake is. I made the Odessa hat and it has a pretty bad mistake right near the ribbing. I just chalked it up to learning. 8. Where is the most unsual spot you’ve ever knit? I don’t know. Every spot is knit-worthy, I guess. I have sooooo missed the Sticks and String Podcast this week. It has become my favorite and now it has been nearly 2 weeks since my fix. Poor David was ill last week. Feel better, David!!! School/work has been ok this week. Syllabi are ready; two are already copied. I’m still working on getting everything on the new course management system (webCT to D2L). 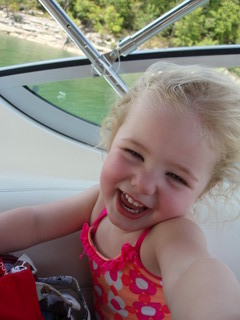 We took Bug on a boat ride (a friend’s boat) yesterday afternoon (played hooky, after all it is still summer, right?). It is still so fricking hot here – over 100F every day for the last month! I was still in denial, even this morning, that the end of summer has really come, but the traffic in the dorm areas this afternoon snapped me into reality… which is why all the syllabi are now done. Bug is doing well in her new room at “school” (read fewer crying fits that we are leaving her there). She has been having trouble going to bed without crying for about 30 minutes lately. 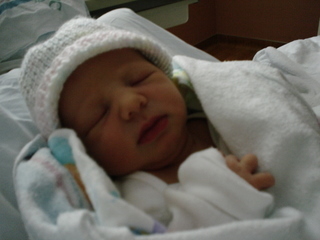 I had wondered if she was having scary dreams or was getting afraid of the dark. I finally put a brighter night light in there and she didn’t cry nearly as long tonight. Not a lot of craft-related things this week. I made an “all about me” poster for Bug’s room at school. It is a collage of pictures on a 12×12 sheet of paper that they laminate to comfort her when needed. I didn’t even think to take a picture until just now. I like doing the digital collages better; it is more tidy. 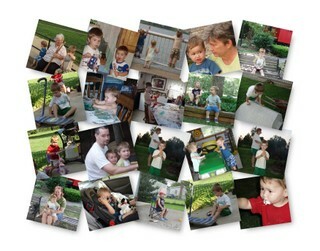 I do like the shutterfly collage software, but it is not user-friendly. I did a 14×11 print for my sister and it turned out really well. 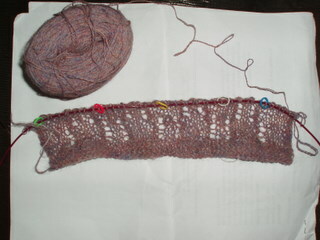 There is progress on the Malagaiter, mostly due to tonight’s visit to the LYS … into the 4th repeat of 6 repeats! I love this pattern (free from Magknits)! I love this yarn (malabrigo)! The greens are deeper than the photo tells. There is thunder outside and lightning, but no rain … what a tease! The school year is nearly upon us here in middle Tennessee – that is for the University. Next week will bring nonexistent parking spaces, even at 7am in the morning. It will also bring a flood of traffic onto the nearby roads that have ALL been and will be torn up for months and months to come. This week I am trying to remain calm and get ready for the flurry of next week. I’m working on revising a lab book, arranging all of my syllabi including “field trips” and incoming speakers, and… I should also be working in the lab and writing papers. Yes, I have a difficult time balancing work and the rest of my life. I seem to think there are more hours in a day than is realistic. I guess all moms are like that, but scientist-moms seem to have a more difficult time with it. We were trained for science to be “first” in our lives, but it shouldn’t be. Me? I’m still working on it. 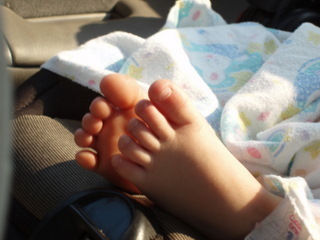 Anyway, on to some happier things… a visit to see the grandparents in Ohio. 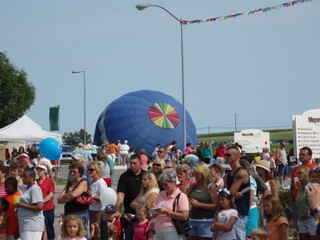 Big balloons of the first Buffalo Trace Balloon Race in Maysville, KY – we didn’t get to do the tethered ride because a ba-jillion people were in line already! 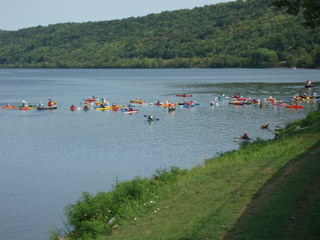 We didn’t know this, but the Great Ohio River Paddle was last weekend as well. We saw the signs when we went down to Ripley’s farmer’s market on Saturday. 1 full lace repeat on the Elizabeth “town and country” lace scarf. Cast on a pennant pattern malagaiter (free pattern at magknits) in malabrigo yarn (YUM). It is wicked-easy! 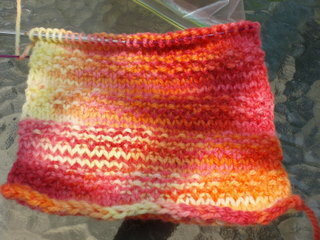 I’m starting to dislike the scratchiness of the heavy kool-aid dyed yarn in the scarf. I have about 36 inches done on it. I may rip it out and make hats.